NIDA’s vision is founded upon : (1) its dedication to service, and (2) its role in international, national, and regional development. NIDA’s extensive service orientation is apparent in its responsiveness to community needs, its continuing education programs, and much of its consulting services, research, and training activities. NIDA is determined to expand its human, institutional, and geographic outreach, making an even larger contribution in the immediate future. NIDA is a dynamic, unique, service-oriented graduate institution which seeks to meet many of Thailand’s and the region’s critical needs in development administration. Recognizing the increasing interdependence of nations across the globe and responding to the priorities of Thailand’s Plan for Higher Education, NIDA seeks to meet the new challenges of international cooperation, understanding, and service. Through teaching, training, research, and consulting, NIDA provides its students with the necessary knowledge, analytical ability, and other skills to be applied at the community, national, and international levels. NIDA’s several schools, centers, and supporting services are constantly evolving as they adopt the latest technology and methodology. NIDA is recognized as a leading quality institution. Faculty members’ task performance greatly contributes to NIDA’s education excellence. Eighty-five percent of the faculty members hold doctoral degrees or equivalent. NIDA’s present and former faculty members play important roles and serve many vital positions in helping regulate national policies and direct national development and administration. NIDA is well-known as a unique higher education institute in Thailand which provides men and women at the graduate level with a variety of skills necessary for public policy planning, decision making, and management in the public and private sectors. 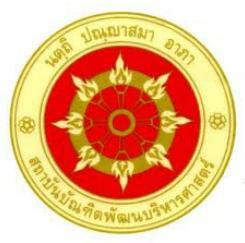 Generally, NIDA’s graduates are currently serving in key positions in both the public and private sectors in Thailand. NIDA’s faculty members and curriculums, as well as programs and services are enriched through various exchange programs and national and international relationships. These are key paths to achieving the goals of an international institution of higher education.